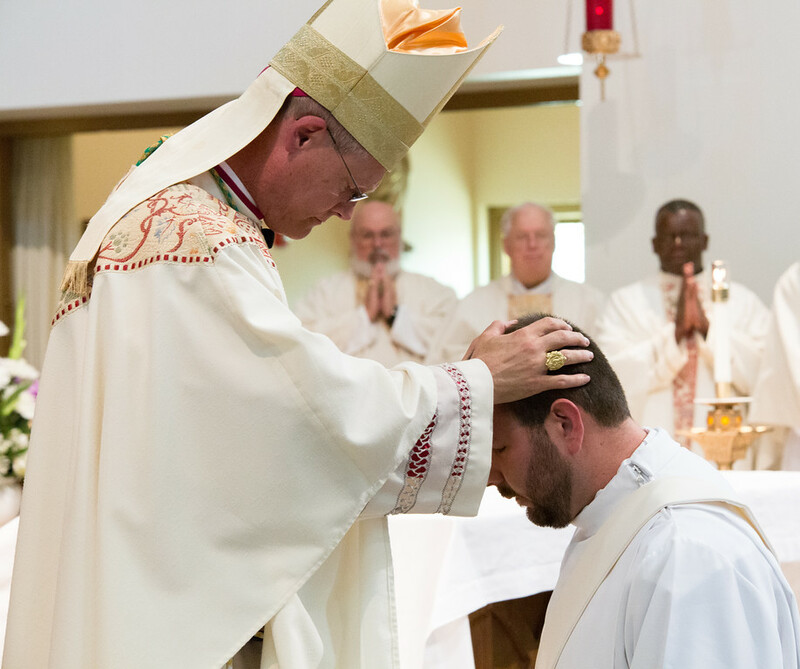 We Give Thanks, God Has Blessed Us With Another Priest. Congratulations, Fr. Andrew Kinstetter! Nothing like an ordination to breath new life into a local Church. The cathedral was full for today’s ordination of Rev. Andrew Kinstetter, and it was a beautiful celebration! Pictures from the ceremony can be viewed here, and as always, I’m very grateful to Matt Potter for his photography skills. Homily is below. 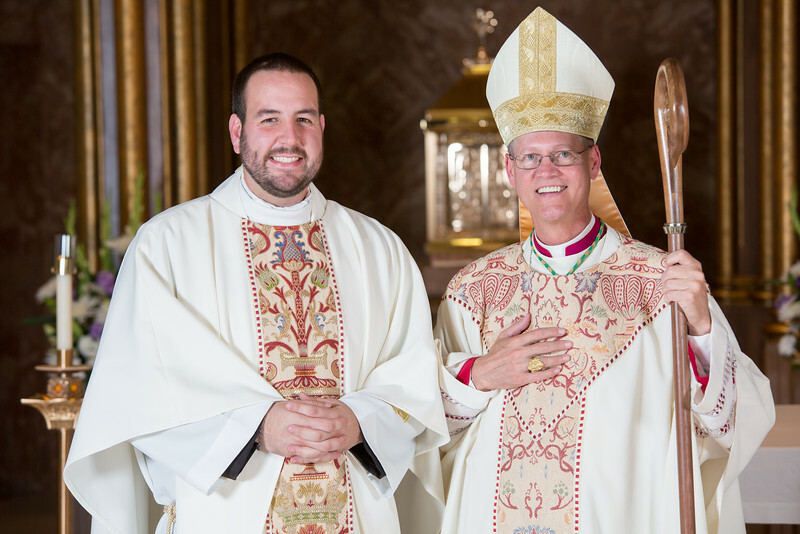 Please join us in grateful prayer to God for the blessing of a new priest! The Gospel selected for today (John 17:6, 14-19) gives us not only a beautiful teaching of Jesus, but perhaps an equally important image of Priesthood. Jesus is at prayer, in the midst of his disciples. Jesus is praying to the Father on behalf of his disciples. This prayer of Jesus takes place as he celebrates the First Eucharist of the Church which is the Last Supper. Of course, the broader backdrop of this ‘painting’ is the Paschal Mystery, the passion, death and resurrection of Jesus. The even more expansive backdrop is the history of salvation which finds its culmination and fulfillment in Jesus. In a way, Jesus shares with the priest a unique participation in all of this. So what does this image of Priesthood have to say to the young man before us today? Plenty! Andrew, take time to pray not only for your people, but in their midst. One of the delicate balances of priesthood involves being both an individual on his own pilgrimage, in need of an intimate relationship with Jesus, as well as one who “is taken from among men and made their representative before God, to offer gifts and sacrifices for sins.” (Hebrews 5:1) The priest must be close to both Jesus and his people. While I was a seminarian, I remember telling one of the formation staff that I would want a chapel in my residence as a priest. He gave me some good advice. He said: “That is fine, but do not forget, your people need to see you pray, too.” Then, later as a priest, I knew the frustration of trying to pray in the church. Inevitably, someone would come in to decorate or clean, or even more often, the parishioner who would approach and say: “Father, I’m glad you are not doing anything. I’ve been wanting to talk to you.” Andrew, waste plenty of time in prayer! It will be the most productive element of your priesthood, and the source of whatever is good in everything else that you do. Always strive for balance in your prayer – and everything else in life. Stay close to Christ, and grow always closer to him. As did Jesus in today’s ‘prayer,’ you too must give voice to the needs of your people, a voice that calls out to God our Father. Your intimacy with Christ will give you confidence that the prayers and petitions you take to the Father will receive an attentive ear and a Providential response. Being close to your people will assure that your prayer to the Father will be up to date and in tune with their needs. Accompanying your people will assure that you do not become too narrowly focused on your own self, which will only lead to loneliness, frustration and ultimately, resentment about the life you have chosen, or rather, that Christ has chosen for you. Jesus Christ is the Eternal High Priest spoken of in our second reading today in the Letter to the Hebrews. As the author of the sacred text tells us, Jesus did not glorify himself. Rather, by his obedience to the Father, Jesus’ entire life and ministry glorified God. None of us takes the stole of priesthood upon one’s self. It is a gift and calling received from Jesus, through the Church. 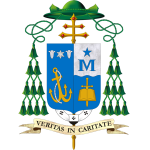 Just as Jesus revealed the Father to his disciples, (John 17:6) the credible and authentic priest is the one who continually directs his people to the Father and His Kingdom. No one claims the office of priesthood for one’s self. 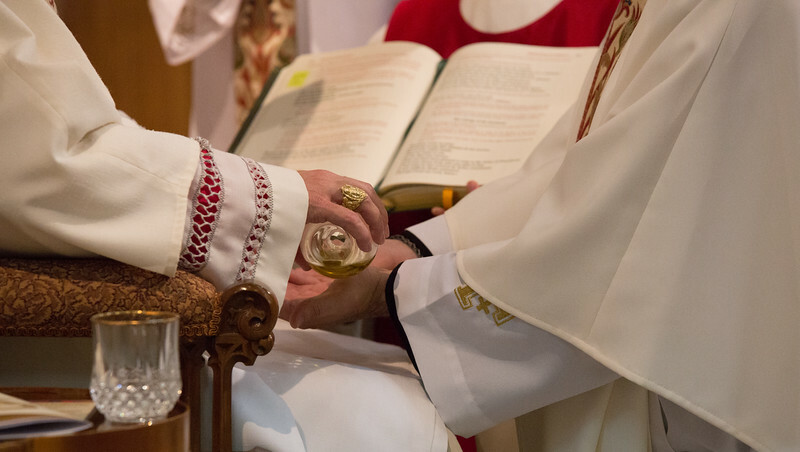 It is only through the laying on of hands of the bishop that the eternal priesthood is bestowed upon us. 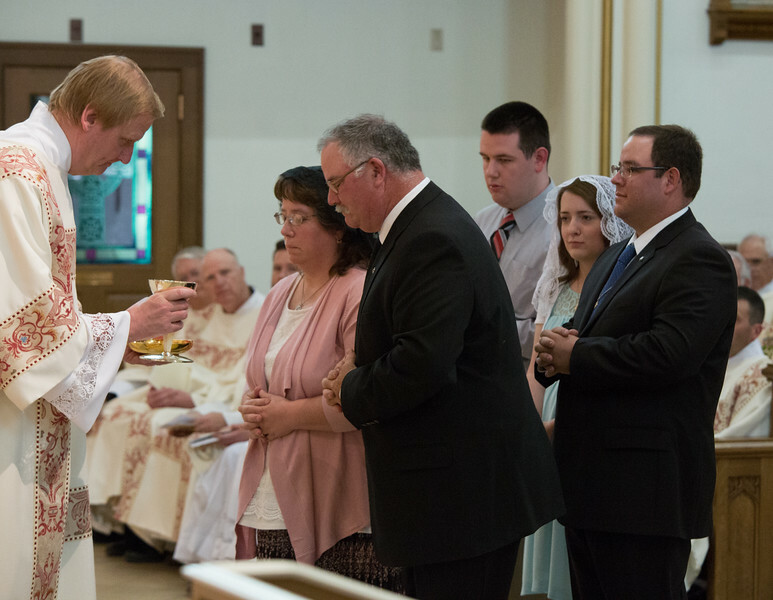 Likewise, priesthood is only valuable and credible when we follow Christ as his disciple, and serve Christ in those he entrusts to our care. Jesus recognized that his disciples ultimately ‘belong to the Father,’ and they were given to him by the Father. Likewise, a good priest realizes that those entrusted to his care are a gift from God. They deserve a pastor’s care, which is rooted in the heart of Jesus. As Jesus was sent into the world by the Father, so Jesus sends his priest into the world. As Jesus gave his disciples the Word of the Father, so the priest is sent into the world to proclaim the Living Word of God. Jesus experienced rejection because of his fidelity to the Father, and he warns his disciples that the world will reject us as well. Andrew, do not be surprised when you encounter rejection because you bring Christ’s truth and love into the world. Do not let this rejection rob you of your joy nor diminish your hope. In part, Jesus prayed for his disciples simply because Jesus is THE Good Shepherd. But Jesus knew his disciples well, and he knew not only what they would face, but he knew their weaknesses. One of the great miracles of the Church down through the ages, and is still true today; one of the great signs of just how much God’s people love the Church and its priests, is that they are not scandalized by our weaknesses. They see beyond the humanity of the Church in her ministers to the reality that through it all, the Church is also Divine. Andrew, part of your formation has helped you to acknowledge your own weaknesses. Some of them, over the course of years, you have been able to correct, perhaps even eliminate. But because you are human, you have also come to know those other weaknesses that must simply be embraced and managed. This is true of all of us. And as St. Paul teaches, these are those entry points in every human life where we must humbly acknowledge our total dependence upon Christ. “I willingly boast of my weakness, that the power of Christ may rest upon me. Therefore I am content with weakness, with mistreatment, with distress, with persecutions and difficulties for the sake of Christ; for when I am powerless, it is then that I am strong.” (2 Corinthians 12: 9-10) The wisest priest among us is the one who has come to realize that his truest and only strength is Christ. The life of Christ is the source of grace for all the members of the Church. The priest not only draws upon this font of grace and goodness, but he is a vessel through whom Christ pours out his grace upon the Church. The life of Christ bore abundant fruit; from the hope he gave through his preaching, his chaste love which your life now mirrors, the healing offered to the sick, the human dignity restored through his mercy and forgiveness, and ultimately, the fruit of salvation won for the world by his death and resurrection. Finally, Andrew, Jesus prayed that the Father would protect his disciples from the evil one. This remains his prayer for us today. No matter how dark some days may be, know that you are always under the protection of Jesus and of his Mother, Mary. After all, our Lord and our Lady are the best tag team in history! I encourage you to have a strong devotion to our Blessed Mother, and in your own good time and discernment, to make a consecration to Mary. Just as Mary’s life was at the total service of God’s will, which meant totally devoted to her Son, her dedication continues today to seeing the will of God and the work of salvation accomplished. With Mary’s help, root yourself and your priestly ministry in the heart of Jesus, and the Flame of love of the Immaculate Heart of Mary will blind the evil one, and the Kingdom of God will continue to advance in this world. (Diary of Elizabeth Kindelman) In the words of a soon-to-be Saint, Mother Theresa of Calcutta: “Be only and all for Jesus through Mary.